An AdWords campaign is an ad campaign within an AdWords account. An AdWords campaign is usually composed of several ad groups. Each ad group serves different ad texts based on the type of keyword a user may type into Google's search engine. Common ad campaign groupings include geography, device segmentation, and product type. For example, A furniture store selling chairs and tables can choose to have different ad campaigns for each of its products. There’s more to an AdWords campaign than sitting back and waiting for visitors to click on your ads. You need to make sure that the ads you’ve created are being displayed to the right people, and that you’re not paying too much for keywords that won’t offer you beneficial returns. Finding time not only to touch on each of these areas but to actually execute them fully is something search marketers struggle with and fall short of on a daily basis. All of these tasks take time and energy -- time and energy that could otherwise be spent on developing new marketing strategies or taking on more clients. With WordStream, this constant flow of iterative tasks becomes so much more manageable and makes the AdWords learning process simple. You still hold the reigns to your AdWords bid management and can make decisions regarding how much you spend, which words you focus on, and how you group them, but the more laborious and time-consuming parts of the search advertising process, like finding and organizing new keywords, are tasks that WordStream is there to help with. You can be sure that you’re enjoying a low minimum bid by choosing the most effective keywords for your campaign, but how do you know what the “right” keywords are? Luckily, with WordStream for PPC suggests keywords to add to your Google AdWords ad text. Because WordStream shows you what’s already working to bring people to your site, you don’t need to guess what words to bid on based on general search data or what you think people are searching for. When you’re directly involved in managing your own campaign, it becomes difficult to try to put yourself in your customer’s shoes. As results with WordStream will show you, your site’s visitors are typing in highly specialized, long-tail search terms that you would never think to bid on. Using WordStream helps you discover keywords, but equally importantly, WordStream helps you to filter them into groups so you can develop a hierarchy of keywords in your AdWords campaign. Then you can decide, based on visitor and conversion data, which keyword groups to build your AdWords campaign from. This makes your AdWords campaign management much easier. Informed keyword grouping directly impacts your Quality Score. Having close-knit ad groups that perform well in your PPC campaigns shows the search engines you’re in tune with what your customers want. Better search results for less money. Still want to learn more about AdWords? Download our AdWords ebooks- they're packed with information and are yours to download for free! 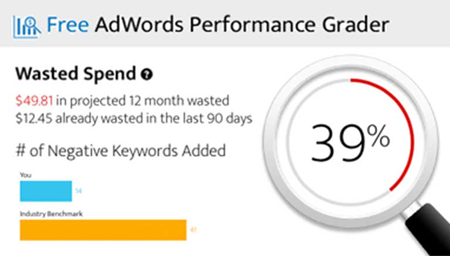 Wordstream’s AdWords Performance Grader is a comprehensive free tool that helps you evaluate how your AdWords campaigns are performing on several key criteria. Looking at indicators such as Quality Score, Account Activity, Impression Share, and Click-Through Rate, the Performance Grader analyzes your AdWords campaigns and compares your score with competitors. The AdWords Performance Grader shows you where and how to make improvements to your AdWords campaign that will improve your performance and save you money.